A slow boat on the Mekong. 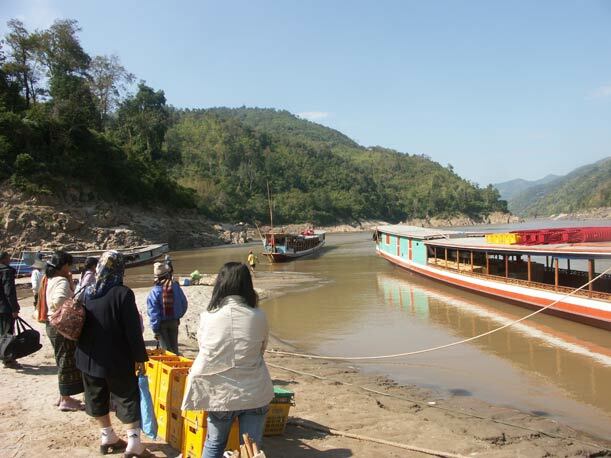 Gently sailing down river from Huay Xai in the far west to the fabulous City of Temples , Luang Prabang. It's the stuff of dreams ... the reality can be a tourist nightmare. 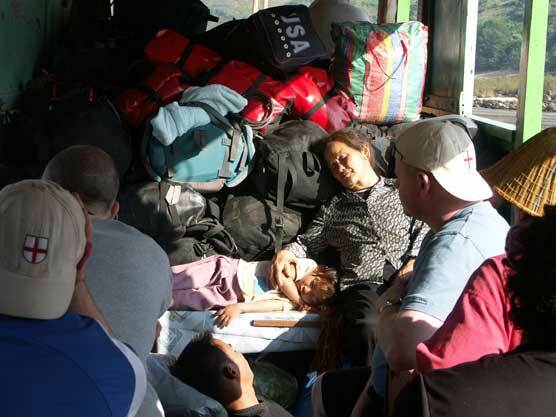 The problem is not the scenery, not in the boats themselves – it is in the way that the Lao operators pack tourists on to the point where there are not even enough seats. That is not every boat, they say. 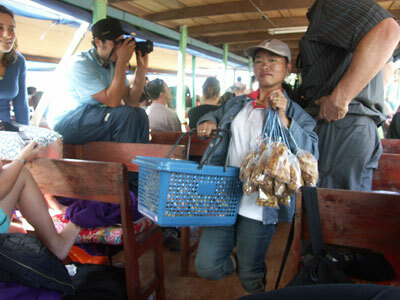 But it is a good number in the peak season of January and February when the falangs flock in increasing numbers to Laos . the conditions are like this (below). The trip is not all bad. You end up having a very sociable time – and the scenery and photo opportunities are tremendous. But take a cushion: you might not get anything to soften the wooden benches. Of course, you could opt for a fast boat. It certainly gives a lift to your sense of adventure, not to mention your stomach contents. They are a lot more expensive than the slow boats but they rocket you 300 down to Luang Prabang in seven hours, including an hour lunch break at Pakbeng. 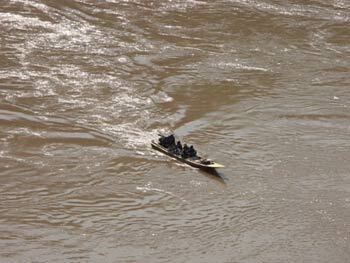 Many people advise against this means of travel, especially when the river is low in the dry season. Hitting a rock at 50mph is fairly final and people say, though I've never seen any official figures, that people get killed on it every year. Then again, the M11's annual toll isn't reassuring – and that's only going to Cambridge. The big drawback – ignoring the price and getting killed - is the same as the slow boats. They pack you in and non-Asian knees and other joints do not fare too well under these stressful conditions. If you want the fun and risk of the fast boat, find a maximum of three others and negotiate a price. You'll probably have to buy the usual six places but the extra room is worth it. And if all that doesn't appeal. There's always the road routes to Luang Prabang. But that's another story.